Home Renewables News Blogs & Opinion Are wind farm communications as in touch as they should be? Are wind farm communications as in touch as they should be? To date there are 6,121 wind turbines in the UK* and they are usually in remote locations, which can bring a number of issues for those working on them in isolation. So is there enough being done to protect them? 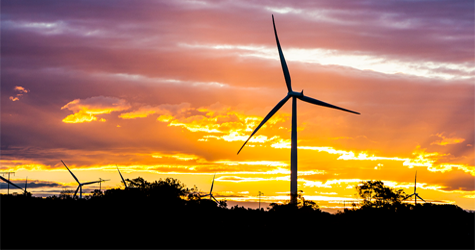 There are unique communication requirements for wind farms and challenges faced by operators when ensuring the health and safety of not only their staff, but also contractors and legislative professionals working in these environments. Often wind farm staff work in pairs and have manual, paper-based procedures in place to record who is on-site and where they are working. But what happens if a worker is injured? Is there a process in place that makes sure they get the help they need quickly? Or if a worker is out working on a turbine and discovers additional work, not covered by their original work-order-form, for which they must get the required permission for before they do the additional work – does this involve them having to drive back to the control room? Additionally, in adverse weather conditions, a wind farm can be forced to close down, and in these circumstances, it can be hard to notify those already working on site and those who may need to access it, if there is no clear communication policy or devices in place. These can all be difficult tasks to manage, however a robust radio-based communications solution can provide site-wide coverage which can help to guarantee the health and safety of remote workers and contractors maintaining wind farms, whilst also increasing the efficiency and speed of the maintenance process. If a wind farm site has GSM coverage, certain solutions can be used to simply make the mobile phone work smarter for the organisation and can turn a worker’s personal or work smartphone into a lone worker device. On the other hand, there may be wind farms that have no GSM coverage but have had data and voice networks installed between the control rooms of each site location. And in this scenario, a specialist provider can install the necessary equipment to provide site–wide communication across the wind farm, and integrate this with the existing data network to provide inter-site connectivity. This would then allow staff across the sites to talk to each other seamlessly, and provide a safe environment for both contractors and staff to work in. Given the complex nature of health and safety on wind farms, it’s important for organisations to bear in mind that the ‘one product fits all’ approach doesn’t always provide the best solution. But with it being the sole responsibility of an operator to ensure that all individuals are accounted for, the need for them to think about having an effective, fit-for-purpose communications system that provides the right cover for all workers and visitors has become imperative and something that requires their immediate attention.